We're giving you a preview of the glamorous Governor's Ball. 1,500 guests are expected to attend the Governor's Ball. The event is held in the Dolby Ballroom at Hollywood & Highland. This is the 26th year Mark's Garden has done floral arrangements for the event. Old Hollywood inspired the theme for this year's Governor's Ball, the party thrown after the Academy Awards. The party's organizers chose burgundy and gold as the colors for the event, something floral designer Mark Held said reminded him of old movie theaters. Held is the owner of Mark's Garden and has been doing the floral arrangements for the Governor's Ball for the past 26 years. "To me that relates to the movie palaces of the 20s, 30s and the 40s," Held said. "And even earlier, before that, to the opera houses in Europe." 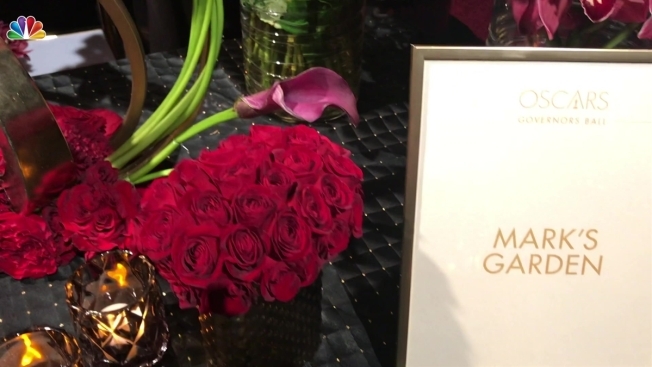 NBC 4 was given a sneak peek at the flowers, food, drinks and décor that will be served to the stars during the event. Chef Wolfgang Puck tells us this year, he's really excited to serve a specialty ham from Spain. "For me it's always about the new. The new flavor, the new experiment," Puck said. "So this year we have the Jåmon Ibérico. It's Spanish ham and you know they are famous for their ham." Other menu items include, Mini Taro Root Taco with Miso Glazed Eggplant and Smoked Soy Mushrooms, Crostini with New York Steak, Classic Chimichurri, Miyazaki Wagyu Beef Tartare on Tapioca Crisp, Togarashi Mini Taro Root Taco with Miso Glazed Eggplant and Smoked Soy Mushrooms, Heirloom Carrot "Tartare," Pickled Mustard Seed, Horseradish, Sunchoke Bark Smoked Salmon Oscars Matzo, Miniature Miyazaki Wagyu Burger, Sharp Cheddar, Remoulade, Sunchoke and Fennel Soup, Truffle Gremolata Potato and Caviar 2.0, Black Truffle Chicken Pot Pie and Winter Truffle Baked Cavatappi with Cheese. And of course the stars need to wash down their meal with a drink. Don Julio has created a specialty beverage served in golden egg called "The Eldorado" that's made of 1942 tequila foam. Coppola Wines, from famed director Francis Ford Coppola, will be serving two limited edition wines from their Zoetrope collection. Each bottle features a unique, zoetrope label to keep stars entertained while sipping away. Additionally, the Sofia Rosé wine, named after critically-acclaimed director Sofia Coppola will also be served to guests. Of course any celebration wouldn't be complete without Champagne. That's being provided Piper-Heidsieck, the revered French Champagne house known worldwide for its red label. This is the fifth year Piper-Heidsieck will be the sole Champagne served during the Oscars awards season. The 91st Academy Awards will air on Feb. 24, and the Governor's Ball party will be held immediately after in the Dolby Ballroom.